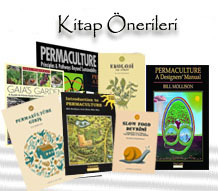 Permakültüre Giriş – Bill Mollison; SinekSekiz, 2011. Smart Permaculture Design, Jenny Allen; New Holland, 2002. Permaculture Two, Bill Mollison; Tagari, 1979. Sustainable Living at Melliodora Hepburn Permaculture Gardens: A Case Study in Cool Climate Permaculture 1985-1995, David Holmgren; Aatec, 2002.